All classes are led by our very talented and knowledgeable instructors. Ask us for help to find your perfect class and level. Classes are heated to between 87-99 degrees unless otherwise noted. Give us a call if you have any questions! Move, breath, and evoLve with our signature intermediate and advanced level 3/4 Vinyasa, Ashtanga & Anusara inspired classes! Evolve is always switching it up with creative sequences, advanced Asanas and groovy jams to leave you feeling renewed & inspired! Our classes are never scripted and never repeat! Prepare to open up your heart, laugh, & soar with grace. This class features inspiring yoga philosophy and dynamic Asana inversions. You will leave feeling energized & evolved; ready to take the world on! This is the EVO-lution! This non stop party will have you moving, have you sweating, and have you begging for more! "EVO" is a high paced workout that combines unique cardio movements, isometric exercises, yoga, weights, and epic beats to keep you going. You may have heard of "sculpt yoga" and maybe even tried it, but not like this! Prepare for the next level of your fitness! EVOLECTRICA: want something extra funky ies? Dress in your best neon gym wear and get moving with this black light sculpt class! This class keeps bringing it in hot with extra cardio and non stop calorie-blasting moves with funky fresh lighting and booming beats! Come prepared to laugh, sweat, and maybe cry... but just a little bit. A perfect compliment to any surfer or athlete. This class will focus on relieving tension in the lower and upper back while opening joints and strengthening core muscles. This class can feature extensive Bandha Locking, Kapalabhati Pranayama, Ujjayi & other types of breath work ranging from beginner to advanced. Our introduction to heated yoga, breakin' it down to the beats evoLve style! This beginner-friendly Vinyasa class keeps it real by guiding you, breath by breath, to a slower groove with the help of advanced instructors! Even if you have been practicing for days or decades, we all need to break things down to the basics from time to time! 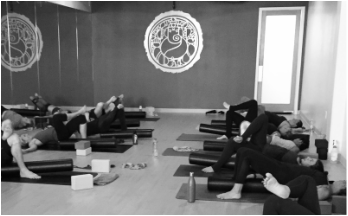 With emphasis in Asana alignment and proper yoga breathing, this class is great for the new yogi or regular practitioner wanting to reconnect to their foundations. Ever imagined matching yoga with a full body massage?? Welcome to Foam Roller yoga!! "When in doubt, roll it out," as class creator Anna Spalding likes to say! Anna has spent several years developing her style to incorporate foam rolling techniques with inspiring Yoga love. Tootsie Roll is a great class for yogis and athletes, and a beautiful compliment to all forms of fitness! Our foam rollers will help lengthen your muscles and remove any aches and pains. An invigorating class that combines restorative Asana and flow to help you heal from the inside out. This beginner-friendly, all-levels practice leads you through a calming sequence that will leave you feeling renewed and inspired. Evolve loves you early birds and understands the incredible power of your morning practice! This sweaty one hour Power Vinyasa class encompasses all the Yoga Asana and Pranayama goodness while leaving you feeling centered and fulfilled (Purna). 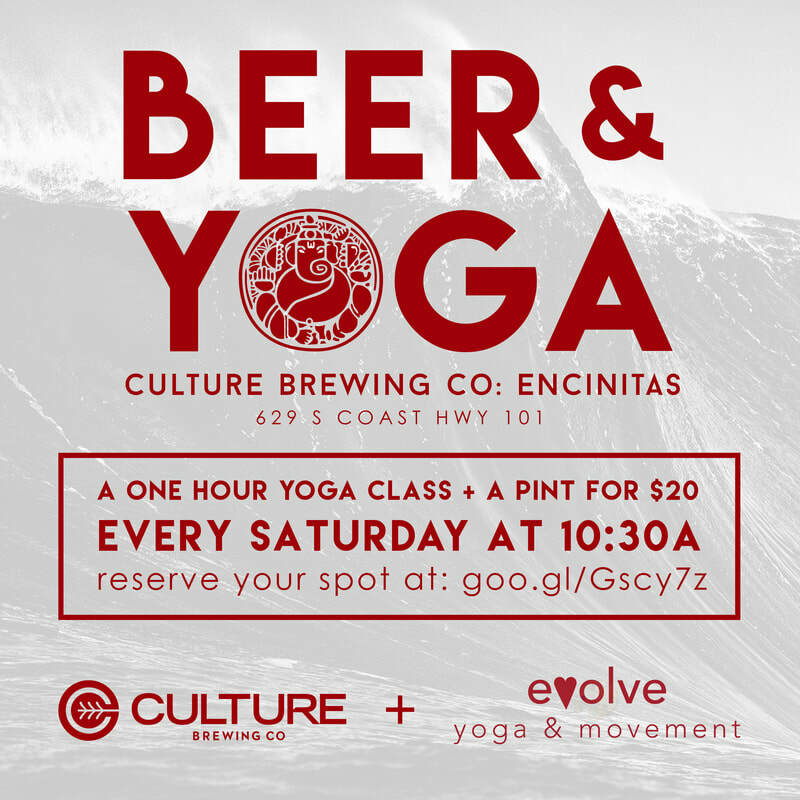 Every Saturday at 10:30 am, join us and our friends at Culture Brewing Encinitas for a 60 minute Beer Yoga class led by our revolving Evolve Teachers! $20 and includes a pint of your favorite Culture Brew! Saturday Funday! Please reserve your spot. You will need a mat, a towel, and as many friends as you can carry! 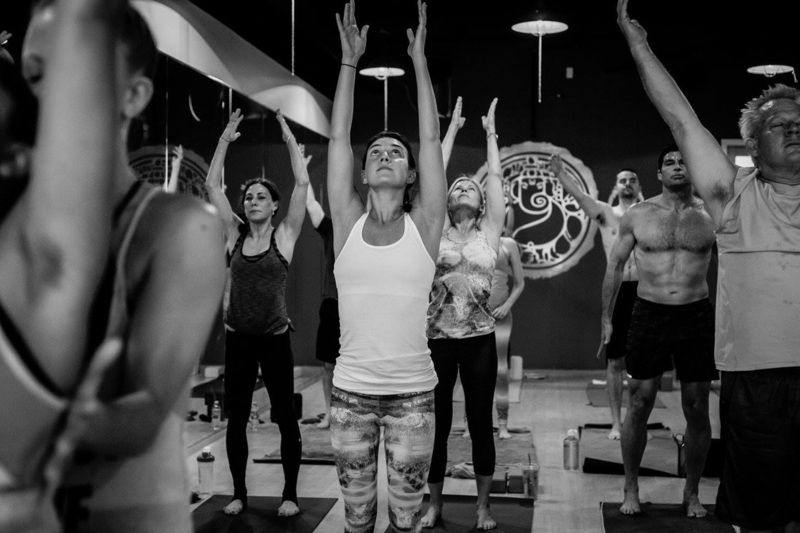 Meet new yogi's, reconnect with old friends, every Saturday with this special BOGA! Let's get hip hOMies! This funky cardio class fuses break dancing basics, Hip Hop grooves, & Yoga to help you sweat the stresses of your day away. No mat needed, so come in ready to get down in this all levels class.